As each work week begins there are essentials you should always have on you! 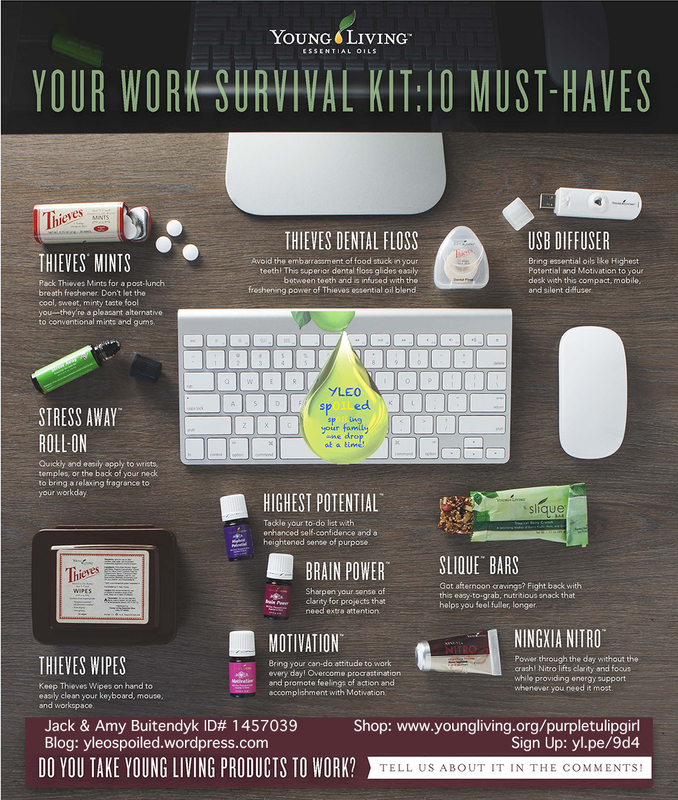 It is your work survival kit! It really doesn’t matter if you work in an office in or out of the home. Here are 10 must haves to make it through each day and week that you have to work. Young Living Highest Potential Essential Oil: Tackle your to-do list with enhanced self-confidence and a heightened sense of purpose. Young Living Brain Power Essential Oil: Sharpen your sense of clarity for projects that need extra attention. Young Living Motivation Essential Oil: Bring your can-do attitude to work every day! Overcome procrastination and promote feelings of action and accomplishment with Motivation. Young Living Stress Away Roll-On: Quickly and easily apply to wrists, temples, or the back of your neck to bring a relaxing fragrance to your workday. USB Diffuser: Bring essential oils like Highest Potential and Motivation to your desk with this compact, mobile and silent diffuser. Thieves Wipes: Keep Thieves Wipes on hand to easily clean your keyboard, mouse and workplace. Thieves Mints: Pack Thieves Mints for a post-lunch breath freshener. Don’t let the cool, sweet, minty taste fool you ~ they’re a pleasant alternative to conventional mints and gums. Thieves Dental Floss: Avoid the embarrassment of food stuck in your teeth! This superior dental floss glides easily between teeth and is infused with the freshening power of Thieves essential oil blend. Slique Bars: Got afternoon cravings? Fight back with this easy-to-grab, nutritious snack that helps you feel fuller, longer. NingXia Nitro: Power through the day without the crash! Nitro lifts clarity and focus while providing energy support whenever you need it most. Of course you can add anything you feel you need to YOUR work week survival kit but for me these are the must haves! Tell me what YOU would put in YOUR kit!